Today’s CEO is charged with the difficult task of delivering profits and growth in disrupted and volatile markets. Innovation is seen to play a pivotal role in driving profit and growth, yet the disturbing trend is that innovation is falling well short of delivering expected results. challenge status quo will struggle in today’s market. Innovation requires change, however driving the change is a personal challenge for most CEO’s. Driving difficult change means you are sticking your neck out by challenging the status quo. The challenges of managing the people in your organisation who are resistant to coming on board to innovation are a real threat to derailing projects. No CEO wants to be lying awake at night worrying if you made the right decisions; you want to have the confidence that the actions you are taking will guarantee success. The dire enemies of innovation are preconceived notions and egos. If I had a dollar for every time I heard someone reject an idea based on preconceptions instead of considering the facts, I would be sitting on a tropical beach instead of writing “CEO Innovation Blueprint” book. Equally you may be sceptical and already have preconceived notions about what this book is about. If you are able to set this aside for the moment and open your mind I promise you will have a different outlook about driving innovation with an aim to driving growth and profitability. This book identifies real issues and explores practical solutions to help CEOs to shift their thinking, to reverse this trend and drive real growth and profits from strategic innovation. 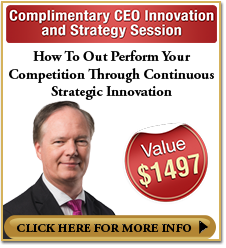 Over and over again I hear directors bemoan how their innovation spend failed to deliver. A famous example is Polaroid where investing heavily in R&D did not stop them going into chapter 11. This book is about practical and insightful tactics that drive innovation without the need for actions such as big spending. Whether you are a for-profit, not-for-profit or government entity, innovation is a critical part of the future development of the business. In the current economic climate most would agree that those who do not innovate will struggle to see the decade out. The key is to do innovation right. Working closely with multinationals, government, small businesses and profit for purpose/non-for profit organisations with their innovation and strategy for over 25 years. It hit me, that we were going about innovation wrong. We had become pre-occupied with the science of innovation and forgot it was about people. it is people that come up with the ideas. I spent time researching what made an innovation leader and why some companies were more successful than others in getting results from innovation. Observing management meetings and board meetings to identify what stopped innovation or progressed innovation, I identified the traits of management and staff in organisations and how those traits drove their engagement in the innovation process. 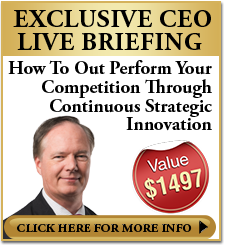 This research drove the development of the “CEO Innovation Blueprint“. This research identified that the corporate strategy had played a significant role in handicapping innovation. Even though innovation is seen as a key to growth and profits, the strategic plan for the business frequently fails to integrate innovation as part of the strategy. When you look at successful innovation companies, they have a strong innovation centric strategic plan that drives their success. 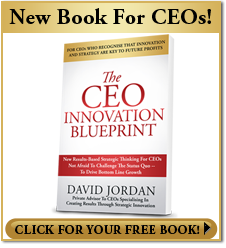 The “CEO Innovation Blueprint” looks at the strategic issues as well as the people issues. The blueprint lays out a real world plan to support CEOs in driving financial success from innovation and allows the CEO to focus on the pertinent issues that will drive actual results.